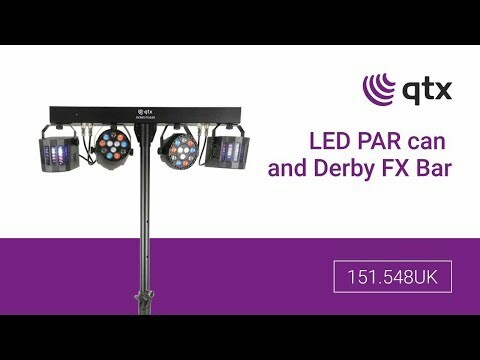 Portable lighting set with 2 PAR cans and 2 LED derby effects powered from a main T-bar. Controlled via DMX, infra red remote control or internal auto and sound-activated programs selectable from a control panel. Each lighting fixture is angle-adjustable to distribute colour washes and effects around the room. Designed as a complete light effects solution for parties, performers and special events. This classic light effect fires narrow beams of light around the room as it rotates. An essential party light. Strong transport bag made of a heavy duty material allowing safe transport of a lighting stand. Fitted with carrying handles and full length zip fastener.